When Ar (1,5 years old) was in a sensory phase, I had this busy board made. It has some latches, knobs, a tap, a bell button and a lamp switch. I had to make sure there were not any sharp edges so that the busy board was not dangerous for him. The materials should be anti-rust, too. He enjoyed playing with it for almost an hour everyday while making a drama as if someone is knocking at the door and he had to open it. by the age of two, he can open all kinds of latches and know how to switch on the lamp, ring the bell and turn the tap. Ketika Ar ( 1,5 tahun ) dalam fase sensorik, saya membautkan ‘papan sibuk’ untuknya. Papan ini memiliki beberapa kait, tombol-tombol, keran, tombol bel dan saklar lampu Aku harus memastikan tidak ada tepian yang tajam sehingga tidak berbahaya baginya. Pastikan bahan harus anti - karat juga. Dia menikmati bermain dengan ‘papan sibuk’ selama hampir satu jam setiap hari sambil membuat percakapan seolah-olah seseorang mengetuk pintu dan ia membukakan pintu itu. Pada usia dua tahun, Ar bisa membuka semua jenis kait dan tahu bagaimana untuk menyalakan lampu, membunyikan bel dan memutar keran. I just found some good books about bible stories. 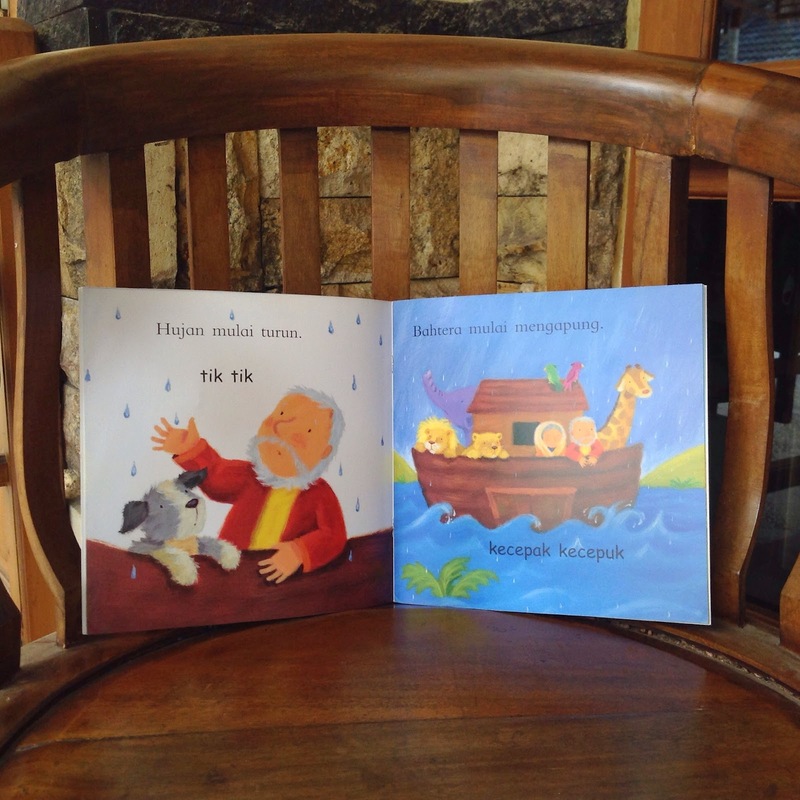 These were Ar's first bible-based activities and he enjoyed them very much. The story books do not have much writing. Moreover, there are some texts of the sound effects in the story. Ar liked to produce the sound effects as I read him aloud. Ar painted a used-plastic jar which I had prepared before. 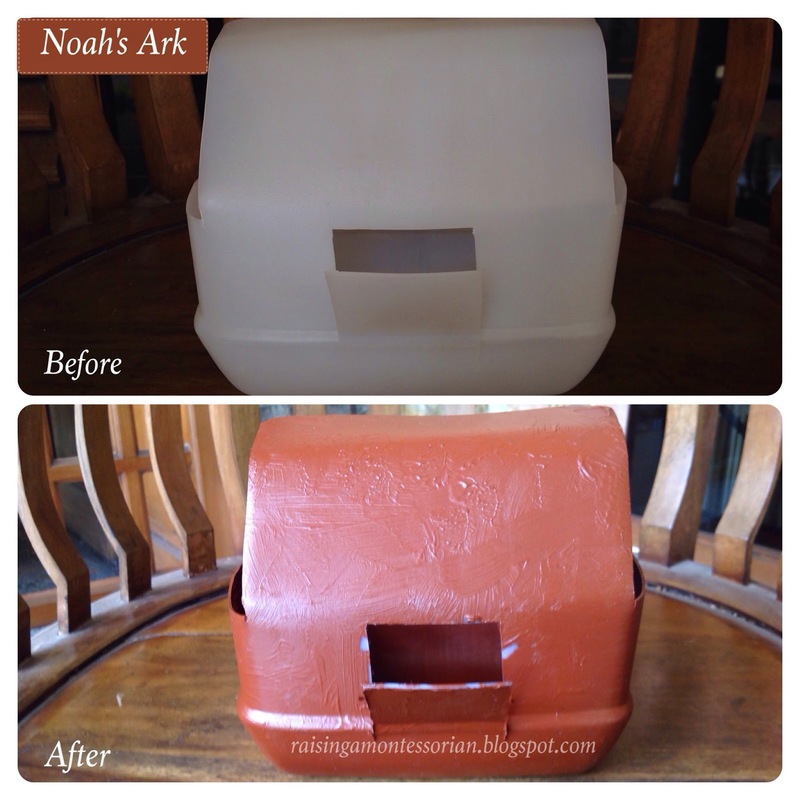 He was going to make Noah's ark by painting the front part himself. Then, I finished the back part. I let it as it is though there are some white spots because I wanted to appreciate Ar's work. 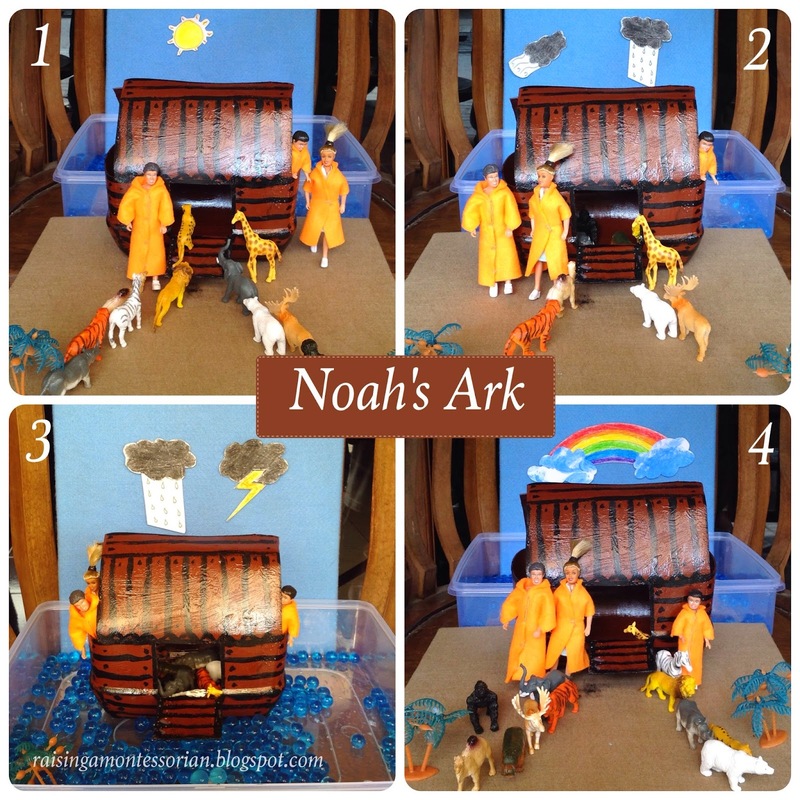 However, Daddy and Ar's cousins said the Ark looked more like a house. Lol. Ar played a sensory bin filled with blue waterbeads. I made different background of the weathers on a felt board so he could learn about the weathers too. 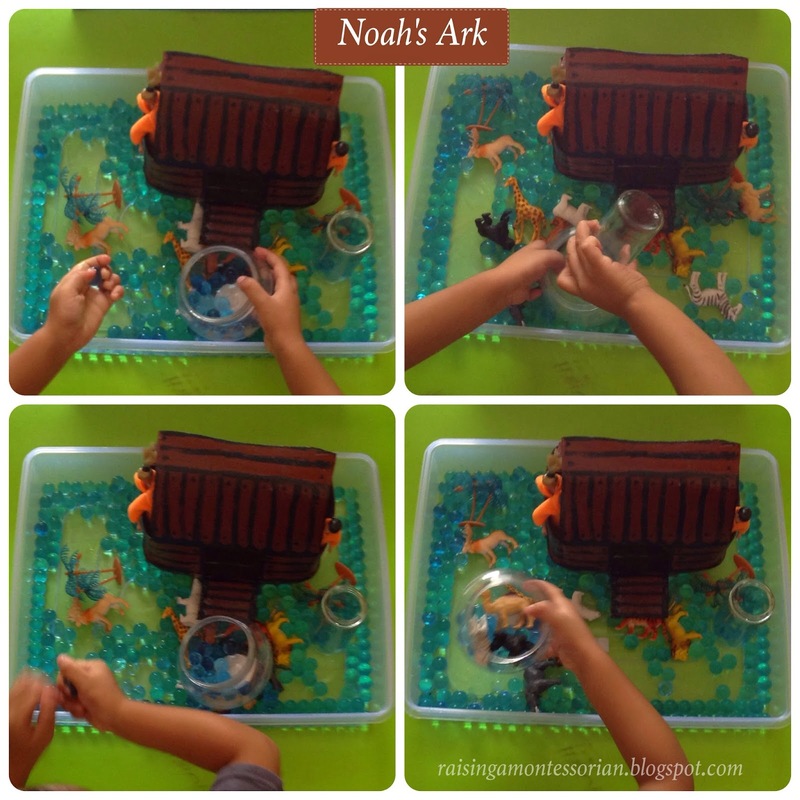 He retold Noah's Ark story and played with the human and animal figurines. Saya baru saja membeli beberapa buku bagus tentang cerita Alkitab. Ini adalah kegiatan berbasis Alkitab pertama yang dilakukan Ar dan ia sangat menikmatinya. Buku cerita ini tidak memiliki banyak tulisan. Selain itu, terdapat tulisan efek suara dari cerita. Ar senang menirukan efek suara seperti yang saya bacakan. Ar memainkan kotak sensori yang diisi dengan waterbeads biru. Saya membuat latar belakang cuaca yang berbeda yang ditempel di papan flannel sehingga Ar bisa belajar tentang cuaca juga. Dia menceritakan kembali kisah Bahtera Nuh dan bermain dengan miniatur orang dan binatang. My son had passed his oral phase since he was 1.5 years old. He could understand my explanation that he should not lick the paint. Therefore, I give him some painting activities since then. If your children haven't passed this phase, you can give homemade edible paint. It is made of corn starch, food color and a little water. Here are some painting activities done by Ar when he was two years old. I prepared a sheet of bubble wrap and Ar wiped the paint onto it. He mixed any colors he liked and turned the bbble wrap sheet down on a piece of paper. The dotted pattern attracted his attention. he loved touching and squeezing the bubble wrap. It is good for his sense of touch and fine motor skill. The focus of this painting activity is on his ability to pinch the paint tube, apply the paint onto the toothbrush and wipe the paint on a piece of paper. 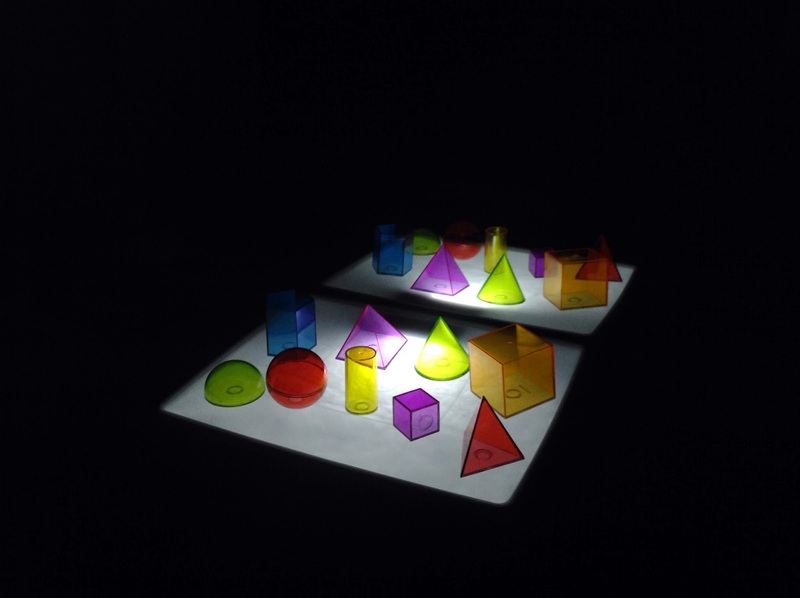 Hand-eye coordination and fine motor skills take great ole in this activity. He dipped the spiky ball on a plate filled with paint, felt the sensation of squeezing the ball and started painting. He even cleaned the spill on the floor. He learnt to be responsible to clean everything when he made a mess. This is one of his favourites. He felt tickles when I brushed the paint on his hand. First, I told him how to do it by holding his hand and put it on the center of the paper. He then created his own pattern on the paper. 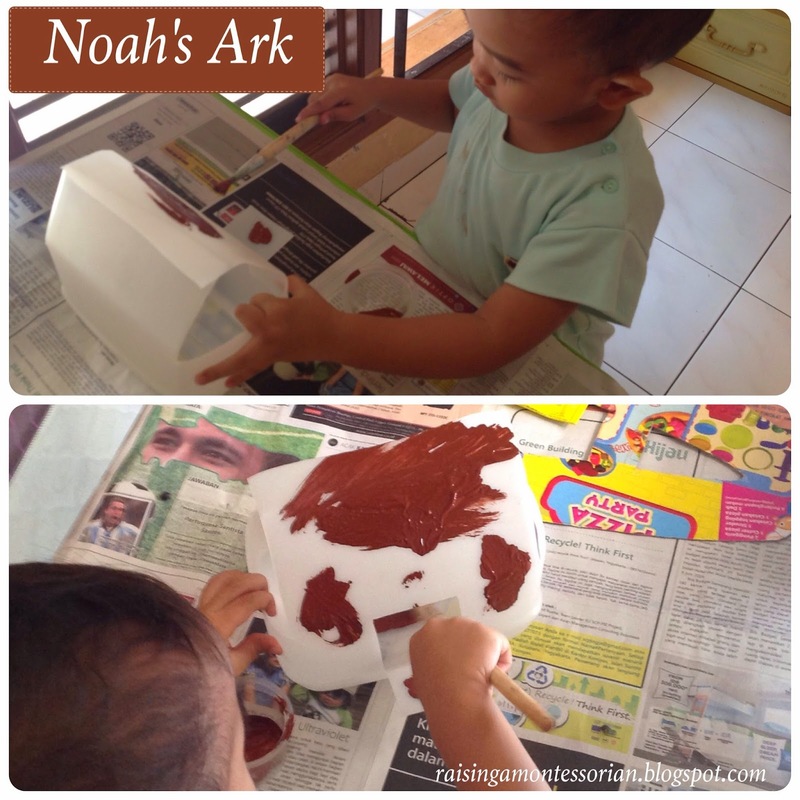 This activity is easy to prepare.I just provide a cup of paint, a paintbrush and a piece of paper. He already know what to do. I put a piece of paper in the tray and squirted some blue paint on it. Ar held the tray and rolled the golf ball on the tray. He said he was making ball tracks.This activity is good for hand-eye coordination. I put different colours of paint on four bars of sponge. Ar just need to splash the sponge on a large piece of paper. He also used the tray to smash the sponge. He could not stop until all the paint had gone from the sponge. 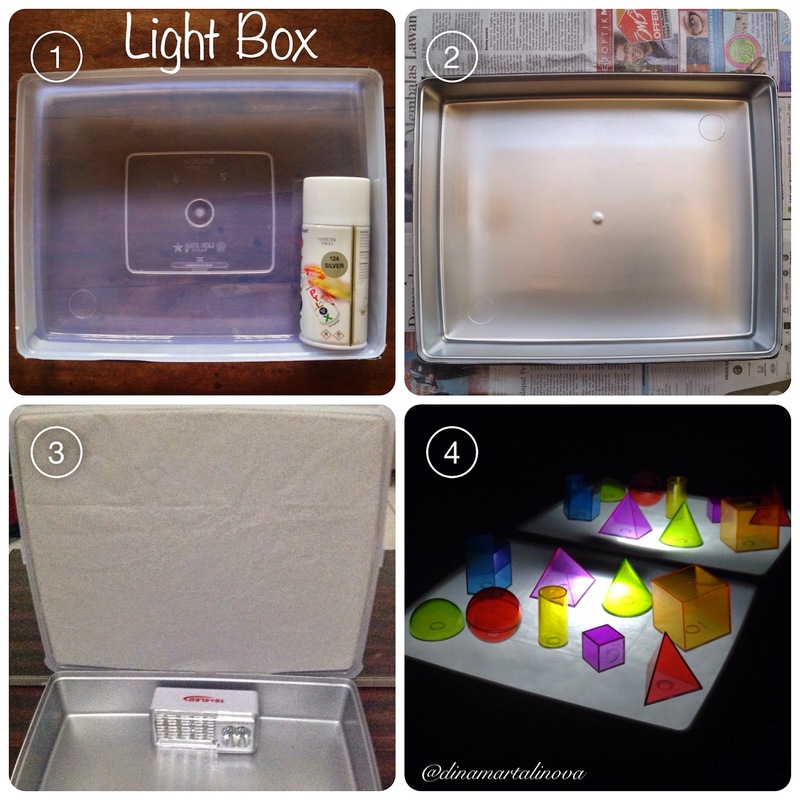 I adore how Motleytoddler made her light box, therefore I followed her instructions to make an affordable one but I also made some adjustments. DONE!! All cost less than USD 7. Seriously?